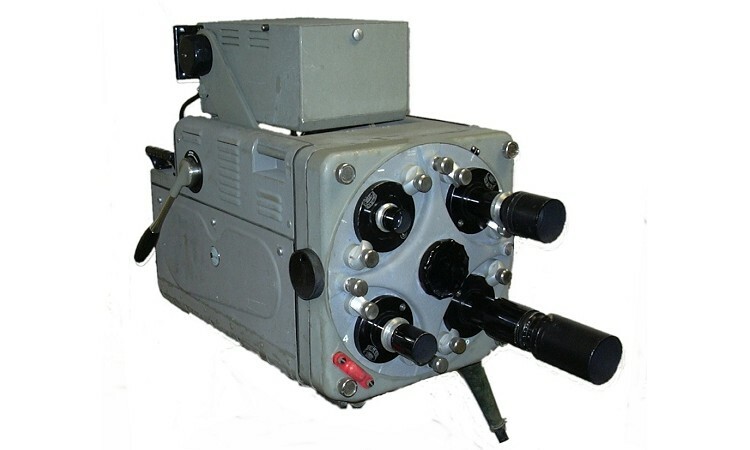 The Marconi MkIII Image Orthicon camera was available with either 3" or 4.5" tubes. The tube was installed from the front of the camera, the complete turret assembly could be removed by slackening the 4 large bolts in each corner of the turret housing. In operation the irises on the lenses were preset to the same value, say f5.6, this gave the same depth of field for each lens and the exposure was controlled by means of a motor driven graduated neutral density filter. The turret was operated by a crank handle at the rear of the camera and the "beer pump" handle moved the tube and its yoke for focusing. It was possible to move the focus control to the other side of the camera, but I have only seen this done once. The "Taking" lens is the bottom left position near the red cue light.